Posted in Sarah Palin. Tags: Gabrielle Giffords, Glenn Beck, Rush Limbaugh, Sarah Palin. RSS feed for comments on this post.. TrackBack URL. Holy crap, that is the last person who should be within a zip code of a firearm, let alone posing like some dough-faced Jack Bauer casting reject. A dios mio. 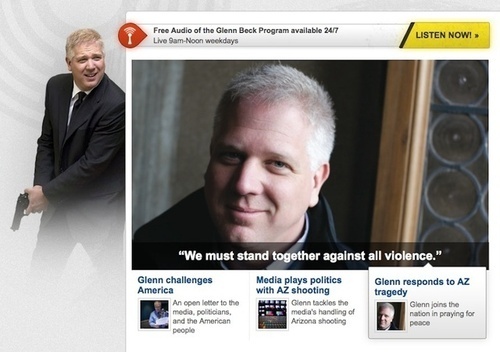 Agree with your concerns about Beck holding a firearm, but the bigger danger from him is the people he inspires. I don’t really think he’d use the gun. I’m not so sure about all his followers.